We offer stunning glass pool fencing at affordable prices with outstanding service. Our range of frameless glass uses sleek, modern lines and a high quality finish. It’s stylish, affordable, and is designed to add value to your property. We create innovative designs for toughened safety glass. Every project is tailor-made for you, with the aim of achieving a complete and perfect solution. The safety of our staff, clients, their employees and the general public is paramount in everything that NZ Frameless Glass does. 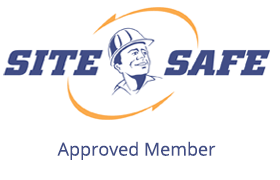 We are proud to be a Site Safe Approved Member.